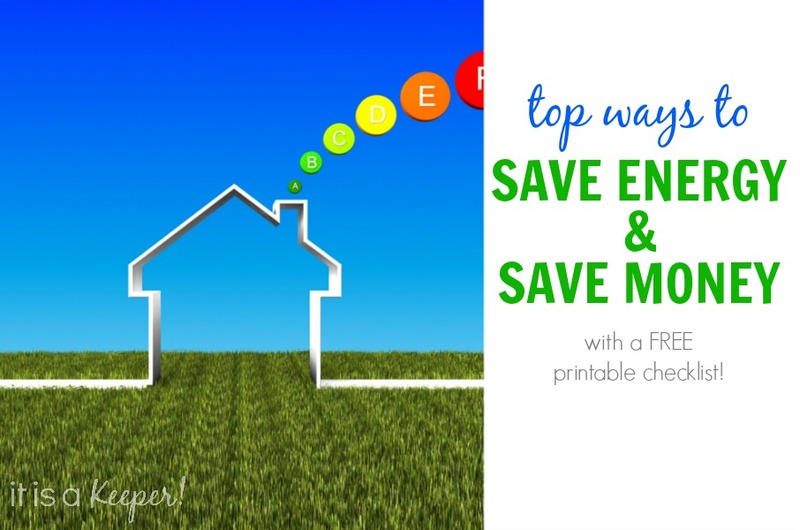 Here are the top ways you can save energy (and money) in your home. Did you know you can make your home more energy efficient even during the hot and humid summer? My husband has been on a mission to make our home more energy efficient. He’s been researching ways to save money and energy on cooling and heating our home. And, he’s been tackling different energy-saving projects for several months now and the savings are really starting to show. Here are some of the things we’ve been doing to save energy (and money!). 1. Clean or change AC filters once a month – This tip will keep your air conditioner functioning at its best. The better it can breathe, the more efficiently it can keep your home cool. If you use a room air conditioner, avoid placing any appliance nearby that would generate heat, such as lamps, a computer or a television. The extra heat may interfere with the air conditioner’s thermostat. 2. Switch out your light bulbs – Install LED lights because they produce light without generating extra heat, unlike more traditional incandescent bulbs. You’ll use up to 90% less energy and save up to $80 over the bulb’s lifetime. And, the more you switch, the more you’ll save. PPL Electric Utilities customers can learn more about LEDs and get instant discounts at participating stores. 4. Save it for later – Feel like procrastinating on some of those household tasks? Now you have good reason to. Wait to do heat producing tasks like baking, using the dishwasher and doing the laundry until cooler hours like late afternoons and evenings. 7. Program your thermostat – When no one is home, why waste energy cooling your home? Program your thermostat to a higher temperature when the house is empty. 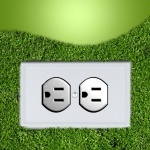 You can save about 1-3 percent per degree, according to the U.S. Department of Energy. Here are some options. 9. Switch up how you cook – Avoid using the oven because it can turn your house into an oven. Instead, step outside and use your grill. Or, use the microwave or a slow cooker. Better yet, try meals and snacks that don’t require cooking, like a refreshing salad. 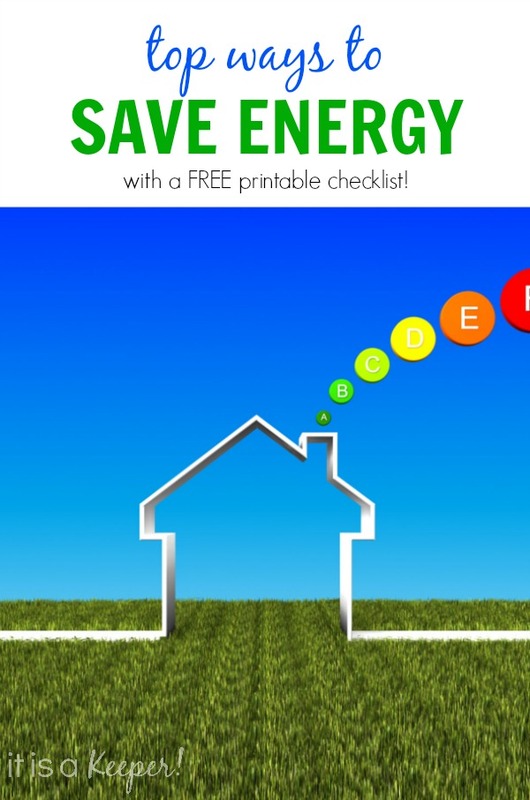 Over the past few months, my husband has done a lot of research on energy savings. He likes to think of our house as an upside down bucket that holds heat. His goal is to keep a comfortable air temperature in our living space throughout the year. 1. Seal air leaks — Use spray foam and caulk to seal air leaks and cracks in your home. Starting in your attic, seal around light fixtures, cut outs in your ceiling, where walls and ceiling meet (top plate), etc. Continue moving down in your home and include areas such as behind window and door moldings. Finish in your basement, by installing rigid foam board and air sealing rim joists. 2. Add extra insulation in your attic. It sounds counterintuitive, but by adding extra layers of insulation it will help keep the hot air from moving downward into your living space. And, during the winter months, it will keep the warm air in your living space from going into your attic. 3. Plant trees. Planting trees around your home will help keep your home cooler by blocking out direct (and hot) sun. 4. Ventilate. Make sure you have adequate venting in your attic, including ridge and soffit vents. While this may be a more costly fix if your attic isn’t already vented, the energy savings will pay off in the long run. It will also help with ice damns on your roof edges in the winter. 5. Pin point the areas that have heat loss. 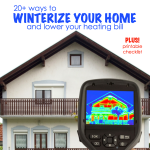 During the colder months, check to see where your home is loosing heat. On the morning after a frost, look at the roof of your home and take notice of areas where the frost or snow may have melted. This indicates heat loss in those areas. Head to your attic and check for ways you can air seal or insulate in those areas. 6. Shrink it. Use a window insulation kit to cover drafty windows. 7. Switch to LED holiday lights. LED holiday lights use a lot less energy, are brighter and last a lot longer than traditional holiday lights. Here’s a printable checklist of things you can start doing today to beat the summer heat. If you this idea, make sure you sign up for It Is a Keeper’s email newsletter! You’ll receive a FREE Kitchen Cheat Sheet Printable as a thank you!